These variations of Pekinese stitch are combinations with other stitches. 5. Individual herringbone stitches are worked between two rows of Pekinese stitches in the first row, and Pekinese stitch is worked over herringbone stitch in the second row. 6. In these two rows, Pekinese stitches are worked with basque stitch and bonnet stitch. 7. In the first row, Pekinese stitch is worked over buttonhole stitch and again a row of pekinese stitch is done under the buttonhole stitch, and the circles of alternate stitches are lengthened with the buttonhole stitch bars. The second row, is trial of individual Pekinese stitches done at an angle. Not very successful though! 3. 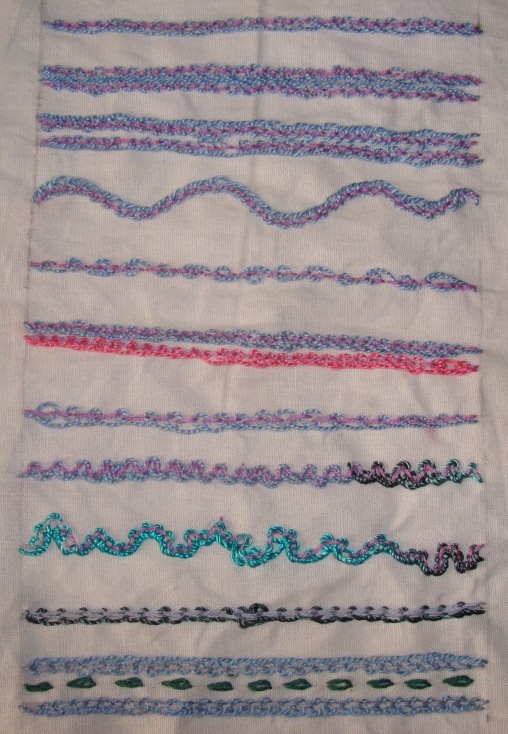 The back stitches are wider in this first row,the Pekinese stitches are worked over a row of zigzag back stitch in the second row, the third row is a trial of various shapes in Pekinese stitch. This week’s stitch is Pekinese stitch on the TAST 2012 stitch challenge by SharonB. 1. The back stitch is done in pink and the Pekinese stitch is done in blue perle cotton .first row, is the trial of the stitch. The second and third rows are two lines of Pekinese stitches facing towards and away from each other. 2. 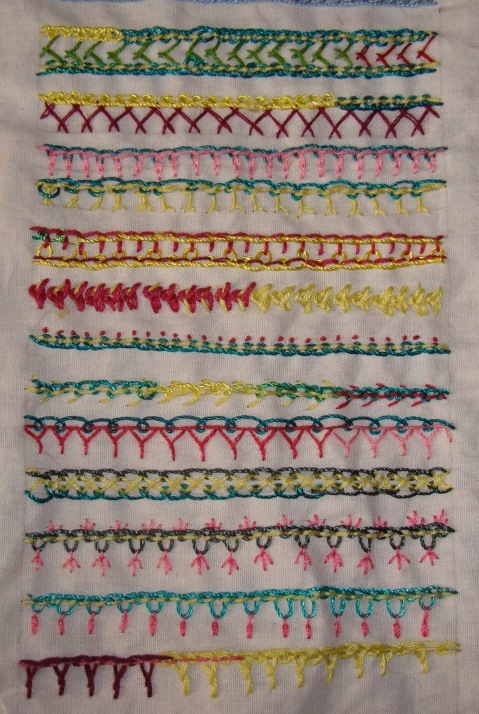 The first row is Pekinese stitch worked in a curved line. The second row, I tried twisting the thread alternatively in both directions[not successfully, though]. The third row is two lines of Pekinese stitch in two colours.